What does philosophy have to say on the question of the meaning of life? This is one of the founding questions of philosophy and has remained a central problem for philosophers from antiquity through to the Middle Ages and modern period. It may surprise some readers that there has, in fact, been a good deal of agreement on the answer to this question: the meaning of life is happiness.The Purpose of Lifeis a serious but engaging exploration and defense of this answer. The central idea that shapesThe Purpose of Lifeis Augustine's assertion that "It is the decided opinion of all who use their brains that all men desire to be happy." In working through the ramifications of this answer, Stewart Goetz provides a survey of the debates surrounding life's meaning, from both theists and atheists alike. 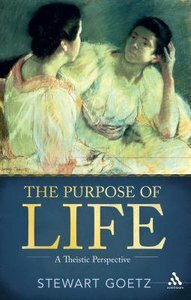 About "The Purpose of Life"
Stewart Goetz is professor of philosophy at Ursinus College, Collegeville, Pennsylvania. He has authored numerous scholarly articles for such publications as Faith and Philosophy, American Philosophical Quarterly, and Mind. Preface; Chapter 1: Clarifying The Question; Chapter 2: Perfect Happiness And Its Atheist Critics; Chapter 3: Perfect Happiness And Its Theist Critics; Chapter 4: Purposeful Explanation And Naturalism; Chapter 5: The Problem Of Evil; Chapter 6: Conclusion; Bibliography; Index.